Cora Wutch and horse Lou at the Broncs and Honky Tonks indoor rodeo this past weekend. When Cora Wutch got up on the saddle at the age of nine, she knew she wanted to be a barrel racer. The Cypress County cowgirl has made her hobby a full-time job since 2012 and was in the midst of preparing her horse Lou for another Broncs and Honky Tonks indoor rodeo Friday. “The professional rodeo, they treat you like family,” said Wutch, who put up a time of 13.696 seconds in the slack Friday. She first started riding ponies at her neighbour’s property as a young kid and it was when his daughters started that Wutch really found her passion for barrel racing. 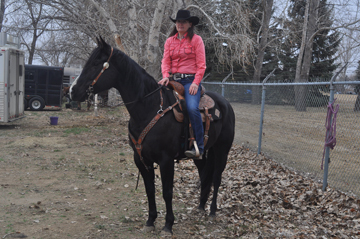 Local clubs such as the Saamis Barrel Racing Club and the Alberta Barrel Racing Association provide local jackpots throughout the winter months to keep the horses sharp, she added. There has been an increase in competitive edge over the years. “A lot of really good bred horses,” said Wutch. “We’ve got some fast horses and there are some right off the track. You get those running bred horses with some cow bred in there. They can really cover the ground and turn. Their times are getting fast. She continously practices by pasture riding, hill riding and keeps herself fit as a rider. Both her horses should be well conditioned for most competitions because now with both her kids grown up, Wutch treats them as if they were her own children.